Rusnock originally concentrated on vertical milling attachments (their 1944 catalog ran to 16 pages) and designs for the first complete Rusnok miller, the Model 70, were not submitted by Edward Rusnok to the U.S. Patent office until 1951 (and granted in 1955). Over the years various identifying Model numbers have been used, through what the precise differences between the types is not known - though the machine remained, externally at least, virtually unchanged. Today by far the best known version is the "85" (or "850") distinguishable from the 70 by its fully enclosed belt drive (the 850 is also offered as the Model 853 with a 3-inch higher main column). One change spotted involves the quill stop; on some types this had a hole with a threaded bar passing through it while others lacked the rod and made do with just a stop plate formed as a square. All versions are designed to cope with smaller jobs and have the ability to run tiny cutters at very high speeds. The whole machine gives the appearance of a very workman-like job with careful attention to detail and an excellent cosmetic finish. 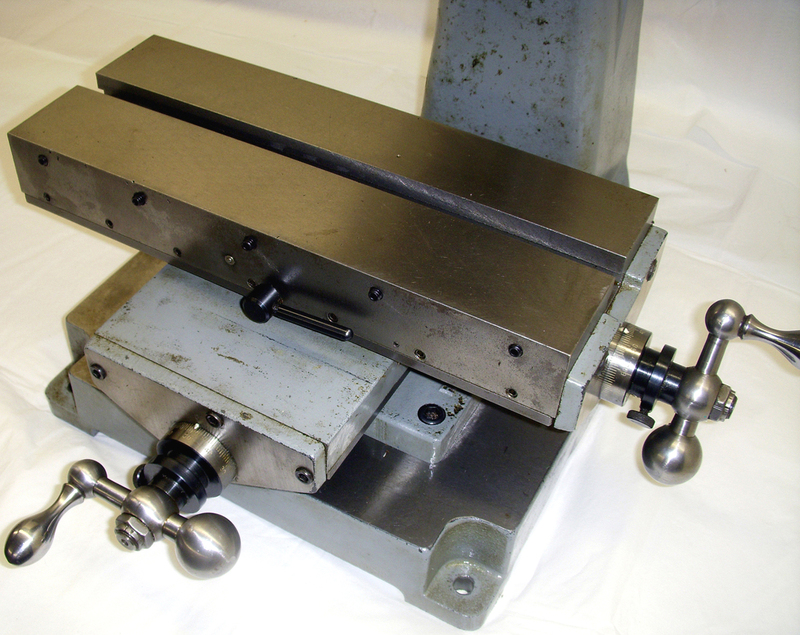 The 5.125" x 13" table carries a single 5/8" T-slot and has a travel of just 6" by 4.5" - its motion driven by large diameter (3/4" x 10 t.p.i) Acme threads running through double bronze nuts with the micrometer dials graduated in 0-100 thousandths travel per revolution. A pleasing touch is that the end plates through which the feed screws run are fitted with roller thrust bearings on both their inner and outer faces - these being a Torrington NTA 815 with washers TRA 815 on the cross feed and a Torrington NTA 1220 with TRA 1220 washers on the longitudinal. 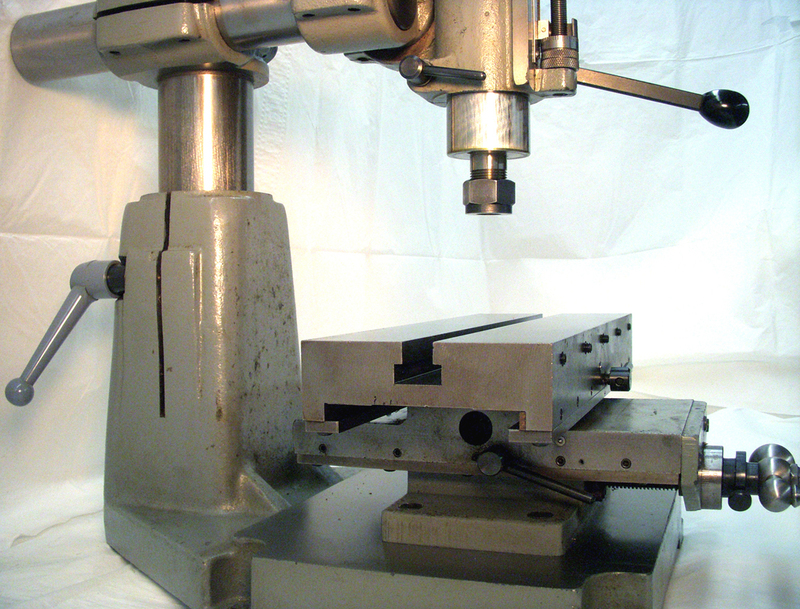 If more vertical capacity is required for drilling operations, the compound table can be unbolted and removed, leaving a machined 10" x 12" surface on which to set a vise, rotary table or other fitting. As the compound table is easily detached, it makes an ideal fitting to put beneath the head of a bench drill for precision co-ordinate work. 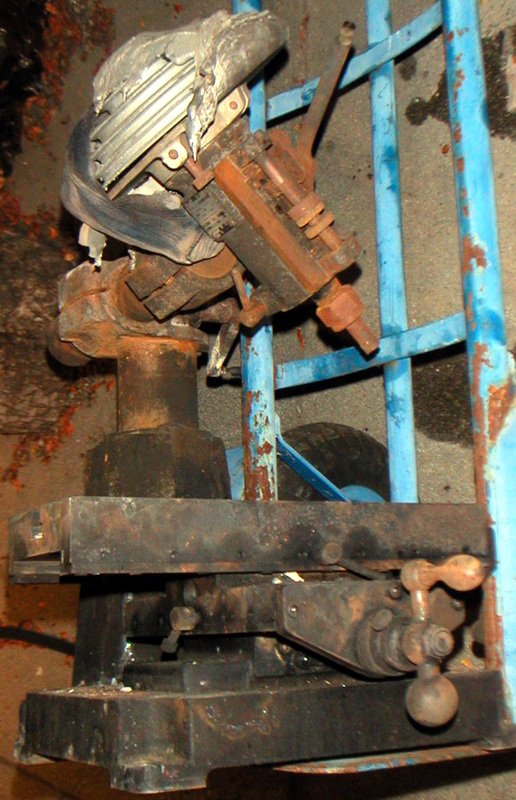 Raised and lowered by bevel gears set in a housing on top of the column, the head can be elevated through a range of 5.75" - the 3"-diameter vertical column being deeply socketed into the semi-steel iron base and fitted with a long key to ensure that its alignment is not lost while being moved. 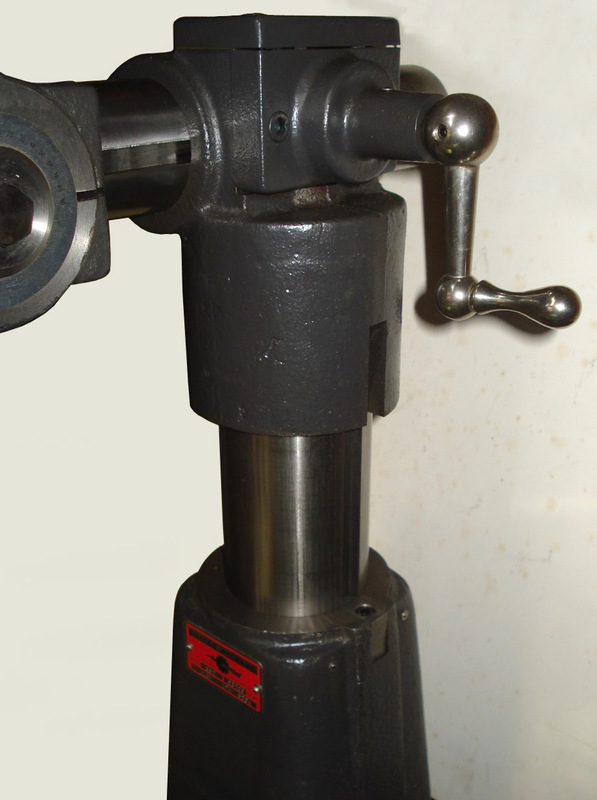 The maximum clearance between the table and the face of a collet held in the nose is 6" - though in the past the top bevel housing could be supplied some 3 inches higher to allow taller jobs to be tackled. 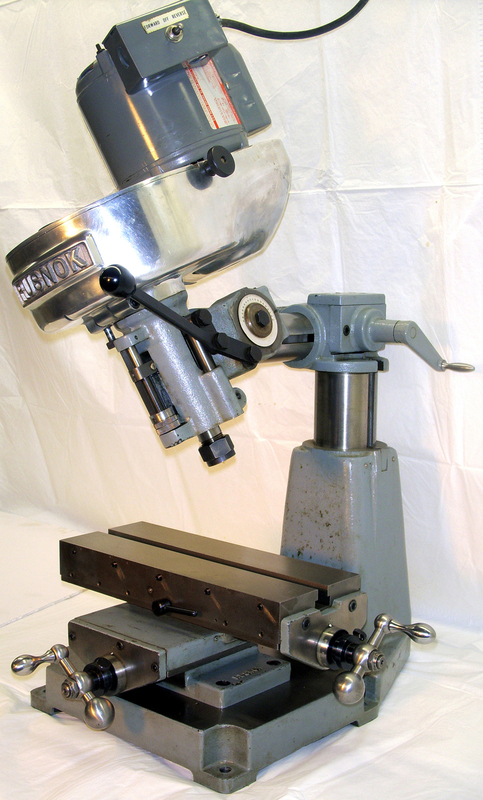 A model of adjustability, the vertical head can be moved in an out though a range of 6 inches on its 2.25-inch diameter overarm, tilted left and right through 90 degrees to bring it horizontal, and also nodded (in the manner of some Bridgeport heads). This range of movements makes the Rusnock wonderfully versatile and, providing the cut is not too deep when the head is fully extended and the cutter angled and tilted, allows complex shapes to be formed with relative ease. A 1/3 hp 110 volt 1725 rpm motor is fitted as standard - but with the option of a 250 or 440 volt 3-phase unit - or others to special order. With the regular motor the five spindle speeds are 380, 700, 1200, 2500 and (a very useful) 5200 r.p.m. 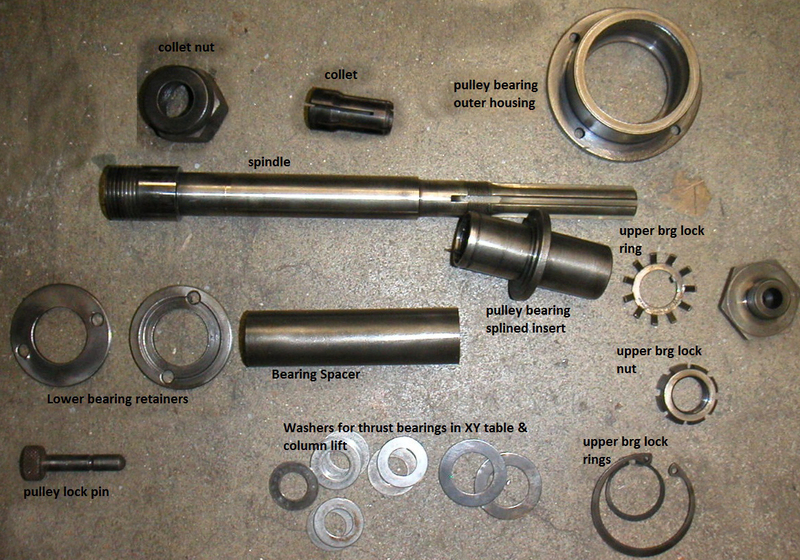 A six-spline drive shaft rotates the hardened and ground spindle on a pair of sealed, double row ball bearings (Type 8404) fitted immediately behind the nose with a "floating" bearing (Type 8503 to allow for expansion) at the top. 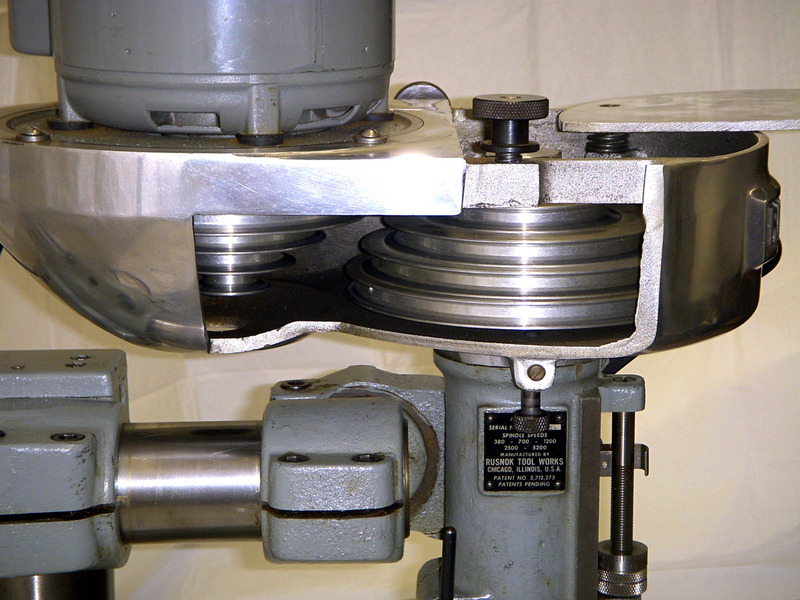 The spindle pulley runs on its own Type 6005 sealed ball races - with the aim of preventing belt pull from interfering with the accuracy of the spindle (originally these were a New Departure Type 3L06). Chrome plated and fitted with a quick-action drill lever and a locking micrometer stop, the quill has 1.5" of travel. Because of its simple mounting attachment many Rusnok heads (like the early Bridgeport type and those by Tree, Halco and Kerney & Trecker (Dalrae) have been adapted for fitting to small horizontal millers - so transforming them into vastly more useful machines. Collets used have varied: one of the early machines, the Model "70", used a "Y" collet shaped rather like an American football. This design (similar to the Schaublin ER) though having a powerful clamping action was restricted to bar stock only a few "thou" outside its stated size if a proper grip was to be maintained. The Rusnok 85 and 850 millers used an entirely different design of collet, the Type 100 (in sizes from 1/16" to 9/16"), although very early examples might have been fitted with a "9B" by Hardinge - almost certainly the same as a Brown & Sharpe No. 9 (and which Hardinge, or Victor Machinery (victornet.com), may still be able to supply). A Rusnok users group can be found on Yahoo. Copied by a Taiwanese company during the 1980s, this imported version seems to have been sold without any identifying marks or badges..
Undergoing restoration by W. Noble of the USA, this Model 80 Rusnock was badly damaged by fire. 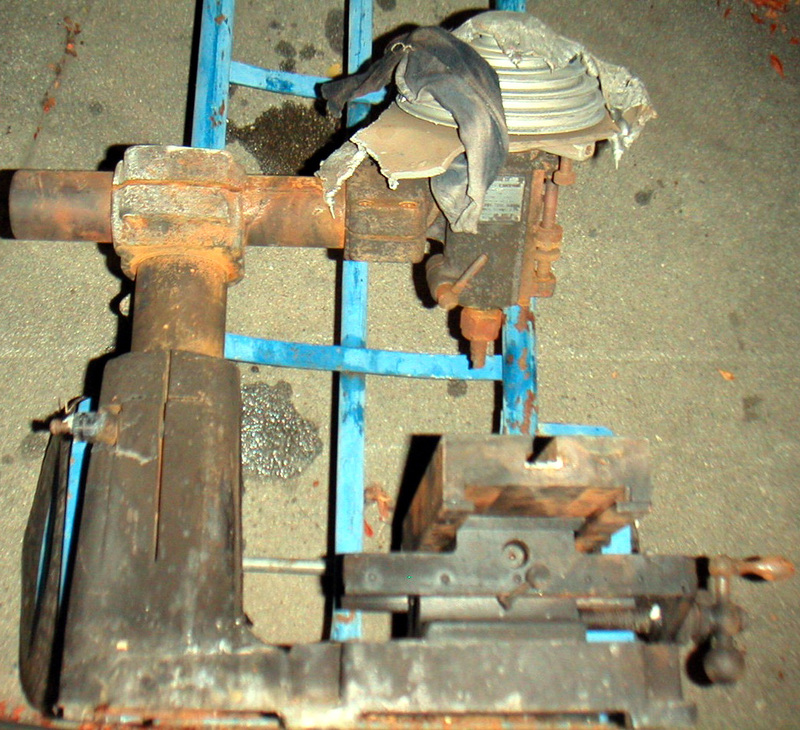 Despite the heat being intensive enough to melt the bearing cages, the main elements of the machine survived. A view showing the large diameter table feed screws - and the ribbed construction of the base casting. Type "Y" collet as used on the Rusnok Model 70.